It was a few minutes before I was able to regain my composure. Lestrade and his men had run out into the street in pursuit of Kessler, while Holmes calmly stripped off his disguise and pulled on his familiar greatcoat and deerstalker. Mary stood at my side, patting my arm supportively and making cooing sounds in my ear. I knew she was lying, but her words did make me feel a little less stupid. The woman from Pinkerton’s appeared to be having a subdued, yet strident argument with Caddy and Schitt concerning the latter’s impersonation of her. “Kessler doesn’t have a sister, honey,” said the woman. The cut-glass English accent had gone, and in its place was a curious but somewhat alluring southern drawl. “Precisely,” said Miss Warne. “You hayve no ah-deah.” And with that she began to undo the buttons of her blouse. The eyes of the two men popped out like plums on sticks, but the lady wasn’t about to expose her feminine resources. Instead, she pulled open the garment’s collar to display a woven circle of some sort of grass or straw that hung around her slender neck. “What?” said I, staring at her. Once again, I was floored by the sheer breadth of Mary’s knowledge. I learned later that at least some of her information had been garnered from reading Curiouser and Curiouser, a monthly periodical which had recently featured an article on Celtic folklore. A glance at Mary told me she was as stupefied as me. Holmes rarely mentioned food, and never in the midst of an investigation. Before I could venture another question, the big-nosed detective had left the room. Caddy, Schitt and Miss Warne immediately curtailed their differences of opinion and hurried after him. Out in the street, Holmes had taken off after Lestrade and the two constables, whose lanterns we could clearly see bobbing about at the far end of the lane. They appeared to be engaged in checking every side road and back alley in the vicinity. Just then, Holmes slithered to a halt, sniffing the air and turning his head this way and that. With his eyes tightly shut, his lips moved silently as they often did when his nasal analysis was at its keenest point. As I watched, waiting for him to spout one of his ridiculous conclusions, one sound did escape his thin mouth. Unfortunately, the phrase ‘Biff Show Lane’ made no sense to me. Assuming the officers had already explored the avenues in-between us and them, I was surprised to see Holmes abruptly whirl round and tear off down a nearby alleyway. Hastening after him, I noted the faint glow from a window halfway along. Approaching the place cautiously, Holmes dropped to his haunches and peered over the sill. Swivelling round, he beckoned us over. “We’re too late,” he whispered, and signalled that I should look inside. Keeping low, I raised my head just enough to see over the windowsill. Steam had misted the glass, but I could make out a long bench, behind which several cooking pots bubbled away on a rusty but serviceable kitchen range. However, it was the huge quantity of blood splashed across one wall that drew my gaze. “Christ on a bike,” I muttered. 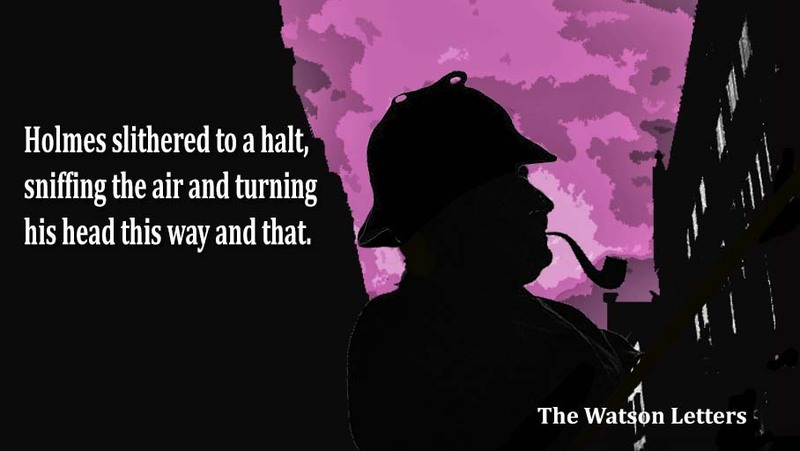 “Have a care, Watson,” said Holmes, standing up. “Caddy, Schitt – you two nip round the back. Watson, you and the others follow me.” Pushing open the door, Holmes stepped across the threshold, a cloud of steam billowing over his head as he did so. Taking out my revolver, I held it like a baton as I prepared to advance. Beside me, Kate Warne pulled out her own weapon. I must have given her a questioning look for she leaned over and whispered in my ear, “My own favourite, don’t ya know – Webley five-shot pocket. Gets ‘em every time.” With that, she pushed past me and followed Holmes into the shop. “Careful, Johnny,” said Mary, tugging at my jacket. She too had one hand on her pistol and the two of us crept inside after Miss Warne. The blood on the walls had splattered upwards as if thrown from the end of a well-loaded paintbrush. The resultant mess appeared to be the result of arterial spray – the kind I might expect from a severe neck wound. I guessed the victim, if by some miracle still alive, would be unlikely to survive more than a few minutes. Holmes had stopped by the long bench in front of the cooking area. Various bowls and plates were scattered haphazardly across the table, but it was one particular bowl that occupied his attention. She nodded. “Werewolves love Chinese food.” She moved away to follow Holmes through to the rear of the building. It was there we found the remains of the shop’s proprietor, Lee Ho Fook. His neck had been slashed so deeply that only a sliver of skin held his head to his body. “Oh my,” said Mary, her face pale. But Holmes was already off again, running towards the door at the rear of the building. Hurrying after him, I grabbed his sleeve and pulled him to a stop. We had stepped outside into a darkened alley. To our left, Caddy and Schitt had paused to investigate a pile of dustbins. To the right was mere darkness. I was about to repeat my question when something moved in the shadows. Before either of us could move, the black shape launched itself into the air with a piercing howl. Whether it was my imagination or some weird effect of the brain, everything seemed to slow down. As the creature flew through the air towards where we stood, my only recollection is of pulling my companion to the ground and the feeling of something claw-like gliding across the top of my head, scrutinizing my hair like some animalistic barber. From somewhere in the distance, a series of shouts and screams echoed back and forth. Strong hands gripped my arms and I felt myself hauled upright. Struggling to focus, I became aware of movement below me and the sensation of the passing of time washed over my entire being. When my senses finally returned, I found myself gazing up at an ornate ceiling, decorated with cherubs and god-like beings. For a moment I wondered if I were in Heaven. Blinking, I managed to raise myself into a sitting position and saw that I was in a large baroque-style bed, in a large baroque-style room. A throbbing sensation began to make itself known, and looking down I saw a bandage around my arm. “I see. Where’s Mary?” I asked. “Bloody hell,” I said. “And Schitt? Where’s he?” Looking around I noted there were no other beds in the room. I blinked. The inspector had never been one of my favourite people, but I had to admit to feeling a deep sense of loss, if not for Schitt himself, then for the life of another human being. It was several days before we finally returned home. Kate Warne had some Pinkerton-related business in Londen and promised to drop in and see us before heading back to the States. Inspector Caddy went back to Titfield to continue his holiday, though I was sure we’d see him again soon. As to my own dear Mary, she was her usual self, though I suspected the adventure had affected her more than she was prepared to admit. Nevertheless, when a telegram arrived from the famous lady racing driver Penelope Pitstop, concerning a series of threatening letters, my wife was eager to join the investigation. As it turned out, those letters were merely the bait to lure us into yet another mystery that would see us fighting for our lives. Now that is a good round up, Colin. Well done. Thanks Robbie – I thought so too, and I think we’ll be seeing more of Inspector Caddy and Kate Warne.